The only complete, scientifically rigorous, fully integrated reference giving a wide ranging and in-depth perspective on cerebral palsy and related neurodevelopment disabilities. 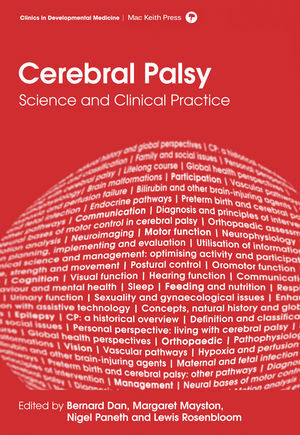 It considers all aspects of cerebral palsy from the causes to clinical problems and their implications for individuals. Leading scientists present the evidence on the role of pre-term birth, inflammation, hypoxia, endocrinological and other pathways. They explore opportunities for neuroprotection leading to clinical applications. An international team of experts provides clinicians and researchers with key information on the mechanisms underlying impairments in movement, development, cognition, communication, vision, feeding, behaviour, sexuality, and musculoskeletal deformities. They present a wide range of person-centred assessment approaches, including clinical evaluation, measurement scales, neuroimaging and gait analysis. The principles of multi-disciplinary management are presented, in terms of therapist intervention, medication and surgery. The perspective of the book spans the lifelong course of cerebral palsy, taking into account worldwide differences in socio-economic and cultural factors. Many chapters are illustrated with clinical vignettes enabling direct translation into practice. Full integrated colour, with extensive cross-referencing make this a highly attractive and useful reference. Professor Bernard Dan MD is a paediatric neurologist, head of the department of neurology and associate medical director at the H?pital Universitaire des Enfants Reine Fabiola, Brussels, Belgium, and full professor of neurophysiology and developmental neurology at the Université Libre de Bruxelles. He was the 2010 President of the European Academy of Childhood Disability and currently chairs the Belgian Academy of Childhood Disability. In addition to his clinical and teaching activity, he is involved in basic research on the functioning and development of the brain. Dr Margaret Mayston PhD, MCSP Trained as a physiotherapist in Melbourne, Australia, (Dip Physio 1973; BAppSc, 1981) and subsequently worked at the Royal Children's Hospital in Melbourne for 4 years. ?MSc in Applied Physiology in 1990 (King's College London) and a PhD in neurophysiology 1996 (Department of Physiology, University College London), followed by a three year post-doctoral fellowship. Currently Senior Lecturer in the Department of Physiology at University College London, UK, co-ordinating an MSc in Neurophysiotherapy for adult and paediatric physiotherapists, carrying out research and maintaining a clinical role by working as therapy adviser at the Bobath Centre for children with Cerebral Palsy and Adults with Neurological Disability. Professor Nigel Paneth MD MPH, is currently Distinguished Professor, at Michigan State University, USA, and also Professor of Epidemiology and Pediatrics, CHM, MSU. ?He has also been Director, Program in Epidemiology, CHM, MSU, Chair, Department of Epidemiology, CHM, MSU and Associate Dean for Research, CHM, MSU. Dr Lewis Rosenbloom, FRCP, Hon FRCPCH, Honorary Consultant Paediatric Neurologist, Liverpool UK. ?He is a paediatric neurologist with a special interest and expertise in paediatric neurodisability. In addition to having developed and co-ordinated a range of relevant clinical services for disabled children, his recent work and publications have been concerned with the causes of cerebral palsy and life expectation of children and adults with cerebral palsy.